Oh, hello there. My name is Ankit. I'm the mischievous son of the mum and son team behind a small Sydney based company teasingly named by my dad, Eat Me Chutneys. So really, it's a mum, dad and son company. Now that I've somewhat got your attention and these gorgeous folks at 1 Million Women have allowed me freedom to share our story, let's stop bumbling around and get on with it. 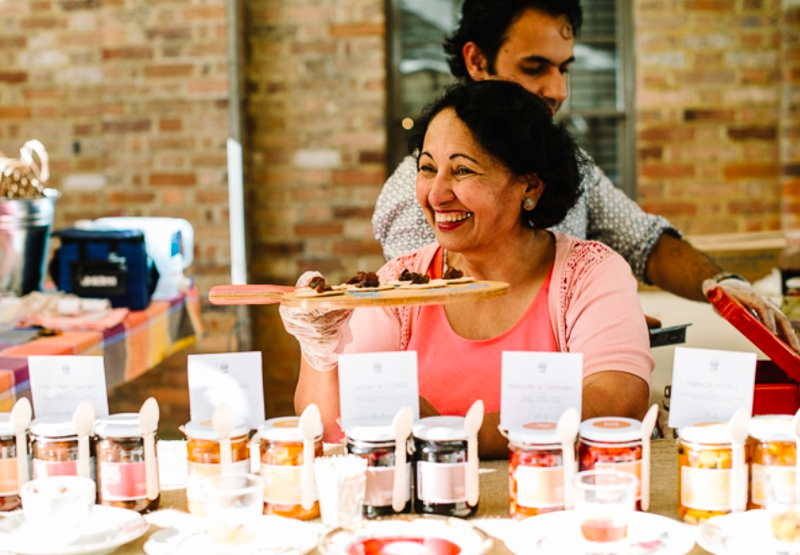 Image: Ankit and his mum at the markets serving up the good stuff! What the hell is it we actually do, I hear you asking? 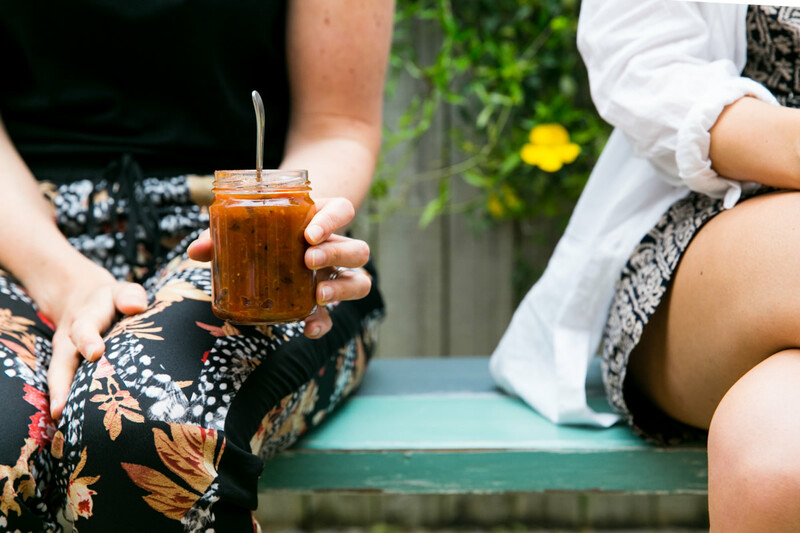 What started as mum's little retirement plan to make/sell her cracking Tamarind + Fig chutney became a year long research project when we got curious as to where all our ingredients came from and who was growing them. Eventually we switched to Fairtrade (and organic) ingredients and in the process our Tamarind chutneys became Australia and New Zealand's first and only Fairtrade certified chutney. It get's one better, 1 of 2 companies globally with such a certification. Alongside, we began experimenting with other gorgeous chutneys; think rhubarb + ginger, cumquat + korean chilli, tomato + kaffir lime . But if you look closely, a lot of produce in our glorious food system gets discarded because of aesthetics. This got us thinking and shaped our little elevator pitch of sorts - just like humans, fruits and vegetables come in all shapes and sizes. 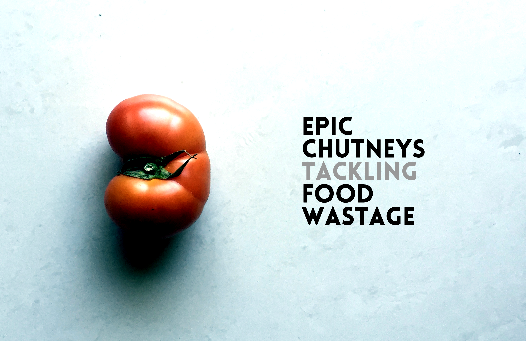 We at Eat Me Chutneys have set out to promote self-esteem amongst wonky yet gorgeous produce. We rescue wonky, bruised and unsold organic/chemical free produce and convert it into epic chutneys that we call rescued chutneys. 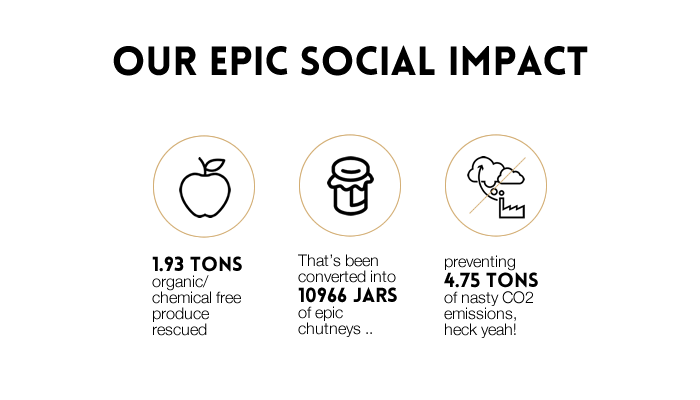 Our social impact to date – thus far we’ve rescued 1.93 tonnes of produce that’s been converted into 10,966 jars of lip-smacking chutneys preventing 4.75 tonnes of nasty CO2 emissions, heck yeah! Oh and us buying Fairtrade ingredients has contributed 5 wheel barrows to farmers in Fairtrade co-operatives <insert happy dance>. This is how I see it – one cannot just manufacture such wild, lip-smacking and socially epic chutneys; they can only be crafted. And so I insist that we don't make products, we craft chutneys. Born in India, Hindi and English were my first two languages until later in life when food became my third language. Rewinding to our early days in India, my brother and I grew up seeing dad grow carrots with two legs and eggplants with ears; looks don't matter he'd proudly tell us. All this produce was lovingly transformed into epic meals by mum. Being late to family meals was a huge faux pas and there was no excuse for it. We were always startled by the accuracy and poetry of their observations and style. However, when we migrated to New Zealand some 20 years ago, I saw perfect looking carrots in these big food spaces called supermarkets, weird I thought? Read more: Wonky veg and ugly fruit are making a comeback. Here's why! During our years in New Zealand and later on in Australia, I completed two Oxfam Cycle Challenges through India as well as Vietnam/Cambodia. Through these travels I got introduced to Fairtrade practices. Concepts such as transparency, sustainability and fairness in a business context were beginning to coagulate better and they all sat nicely next to the values instilled in us by our parents. My next move was to London where I saw friends make pasta from scratch. But there was a small problem - I couldn't cook. So I began to teach myself and loved it. Perhaps loved it a bit too much. I eventually decided to ditch my corporate world job to train as a chef in Le Cordon Bleu and then at L'Astrance ; both in the food mecca that is Paris. Post Paris gig I moved back to London, where I began volunteering in soup kitchens. When I eventually returned to Sydney I decided to run a hidden kitchen that I lovingly called Jaune , a mystery dinner experience with 5 courses for up to 8 guests. Lots of fun, it allowed me to explore and learn further. So we've got the super hero dad that grows his fruit/veg, mum that taught us importance of family meals, the ever encouraging brother and of course the very unruly, me. The next phase of life saw all things we as a family are passionate about connect – social consciousness, growing/cooking/eating and above all our values. Boom, Eat Me Chutneys was born and in it we inculcated a simple thought that we respect the people, planet and its resources. Authenticity became an uncompromising value - a commitment to "doing it right" with minimal tradeoffs and a capacity to endure pain where required if that's what's required for the best, long term outcome. So really Eat Me Chutneys has been 35 years in the making. Till next time, big chutney hugs to you all from mum, dad and me!